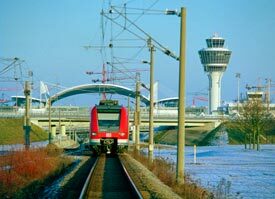 ABOVE: S-Bahn lines 1 and 8 provide frequent service between the airport and central Munich. Trains are comfortable, with room for luggage. S-Bahn. To reach central Munich, follow the S-Bahn signs to the commuter rail station in München Airport Center. There, you can buy tickets from vending machines or a ticket counter. Trains depart six times an hour from 6 a.m. until 10 p.m., with less frequent service during the night. Major downtown stops include the Hauptbahnhof (main railroad station) and the Marienplatz in the pedestrian shopping zone. The journey takes about 40 minutes, depending on the train and where you plan to get off. If you have bulky luggage, stow it by the flip-up jump seats near the doors. Two lines--S1 and S8--run from the airport to downtown Munich. Their routes are slightly different, but both will get you to the city center. If you're obsessive-compulsive about train schedules, you can pick up a tiny pocket-size schedule for the S1 and S8 lines from brochure racks in the airport. You'll also find schedules, ticket prices, and other S-Bahn information at the multilingual MVV Web site. If you have luggage, grab one of the free baggage carts in the airport. You can use it all the way from the baggage-claim area to the S-Bahn platform. For step-by-step advice on using public transportation in Munich, see our article on How to ride the U-Bahn and S-Bahn. Buses. Lufthansa buses connect the airport with Munich's main railroad station every 20 minutes during the day. However, they cost more and are less convenient than the train. Taxis. A cab ride into central Munich takes about 35 minutes (or longer in rush hour) and can easily cost 60 euros, depending on your destination. Rental cars. Follow the "Mietwagen" signs to the car-rental area. MUC has the best rental facilities that we've seen in a major airport: You just complete your paperwork at the rental counter, then step through the adjacent doorway to get your car. There's no need to take a shuttle bus or wait for a car to be delivered. Our partner, Auto Europe, often can save you money on car rentals with its "lowest-price guarantee." Click here for information and rates. Germany is Europe's cheapest country for car rentals, so--if you're renting a car--you may be able to cut your vacation costs by flying into Munich instead of arriving in neighboring countries such as Austria and Italy. Photo copyright © Munich International Airport. Used by permission.